Lots of pensive shots lately. 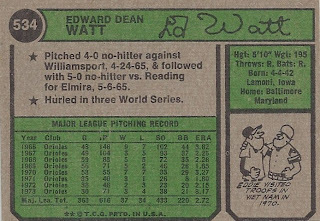 This one shows Eddie Watt at Yankee Stadium, a place he wouldn’t be visiting too much any more since as shown by the second card he was traded to the NL. Eddie was a short-inning closer before there really were short-inning closers. During the Oriole pennant seasons of the late Sixties and early Seventies he pretty much averaged an inning an appearance. That changed a bit in ’73 as his first off-season knee injury – he would have about ten of those, including most well after he played – gave him a lot more innings in less games as he began to mix in more middle relief when the O’s moved other guys into the closer role. 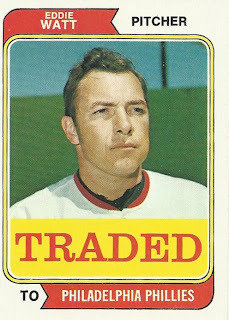 Eddie had probably been expecting a trade since early ’71 since nearly every time he was announced at home he got booed because he gave up a homer to Lee May in the ’70 Series. That’s tough: three seasons of that after they won the damn thing anyway. Eddie actually pitched pretty well in post-season play and was awfully solid for a bunch of years. He was originally part of the package that was going to be sent to Atlanta after the ’72 season to get Earl Williams but that deal fell through. So leaving Baltimore for Philly was probably a happy event for Eddie. On his Traded card he looks to be in Baltimore. Eddie Watt grew up in Iowa where in high school he was an All-American hoops player. He then got a basketball scholarship to Iowa Teacher College (later the University of Northern Iowa) and since freshmen weren’t allowed to play varsity he played local semi-pro ball that spring of ’60. He returned to play both sports his sophomore year and nearly pitched his team into the CWS before losing to Oklahoma State. It was during that time he was discovered by the Orioles for whom he shortly thereafter signed. He returned to school and then started things rolling the following spring, going 11-11 in the rotation in D ball. His ERA was 2.19 and he recorded 170 K’s in 160 innings so it was a nice start. In ’63 he moved to A ball where he hurt his arm but still had a decent year, going 10-12 with a 3.14 ERA, still recording strikeouts at a pretty good clip. In ’64 he went 17-2 in a season split between A and Double A ball, with a 2.04 ERA. In ’65 he pitched two no-hitters the first weeks of his Double A season and after going 7-2 with a 1.85 ERA at that level he moved up to Triple A where he went 6-4 with a 3.52 All that time he displayed pretty excellent control. 1966 was a pretty good year for Watt. He finished his degree in education and made the cut for a pretty good team. He began the year as a spot guy, getting 13 starts in his 43 games. But he tended to do much better in relief than in the rotation so by the end of the season he was strictly a pen guy. Though the Orioles won the Series Eddie got no work because the starters finished pretty much all their own games. 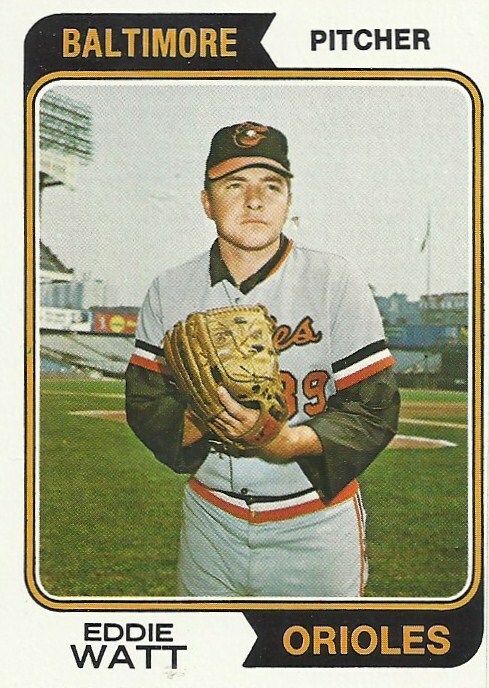 In ’67 he did a bunch of set-up work and got eight saves despite missing a month with a broken hand. Then during the ’68 season he moved into the closer role and over the next four years he recorded a total of 50 saves and pitched in three Series. In ’72 his load lightened a little because of the knee and his saves fell to seven and then five in ’73. After the trade he did an OK job in the Phillies pen – 1-1 with six saves in 42 games of mostly set-up work – but was released just before the ’75 season began. He then signed with the Cubs and for them had a couple tough up top innings and went 4-5 with a 3.89 ERA and seven saves in Triple A. Then it was on to San Diego for whom he would pitch only in Triple A through ’77, that last year as a player/coach. That essentially ended Eddie’s mound time and he finished with a record of 38-36 up top with a 2.91 ERA and 80 saves. He also went 65-43 in the minors with a 2.89 ERA. He was a pretty good hitter, batting .190 with three homers in the majors and .240 in the minors. In the post-season he went 0-3 with a save in eight games while putting up a 2.53 ERA and striking out eleven guys in that many innings. Watt dug the coaching gig and from ’78 to ’81 he managed in the San Diego chain, putting together a record of 290-263. He then did minor league pitching coach work for the Phillies (’82-’85); Houston (’86-’89); and Atlanta (’90-2002) after which he retired. He returned to Iowa where he golfs and goes to occasional card shows. 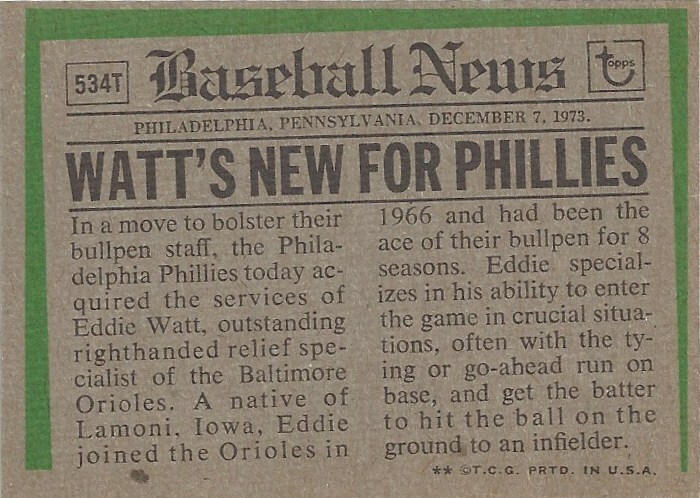 There are Eddie’s no-hitters in ’65. He traveled a bunch as an Oriole. He also did a tour of Japan with the team after the Series win that culminated in the O’s taking down the Japanese series champs. Topps gets clever with the Traded headline. 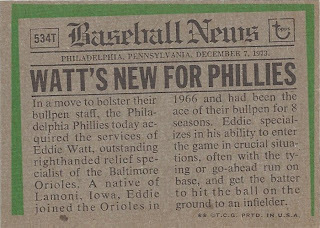 Eddie was bought by the Phillies for about $70,000, which was a pretty good sum back then. And they were right in that last line. He had morphed from a strikeout guy to a ground-out guy during his first couple O’s seasons. 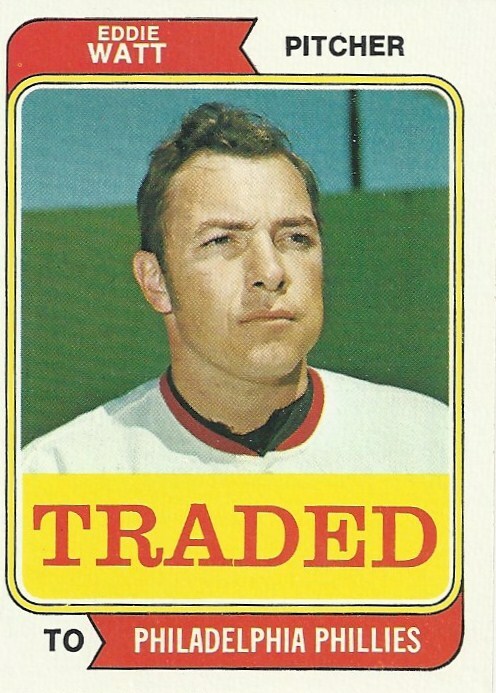 When I was a kid, I thought his traded card looked like Captain Kirk. As soon as I saw it here I thought, "William Shatner!"